If you’re interested in drumming news from around the web, here are some of the stand-out articles from past week! Featuring Dave Grohl, Andrew Tkaczyk, Joey Jordison, Terry Bozzio, Ringo Starr, and more. Loudwire reports that Dave Grohl is playing drums on Tenacious D’s new album Post-Apocalypto, due to be released November this year. Along with the new album, a 6-part animated series (hand-drawn by Jack Black) will be released on Tenacious D’s YouTube channel. This is something I’ve been excited to share for a very long time. My Dad is quite the handy-man, and came up with this great idea. Playing drums with a prosthetic leg just wasn’t working out. The timing was way too off. There was a latency. It was awkward and clunky. My Dad had a vision of designing me a device where I didn’t need to attach my prosthesis at all. This way there is no weight my limb has to lift which eliminates fatigue, and gives me a FAR better action when striking the pedal. With that said, I still have a long way to go before I get it 100% down, but it’s absolutely the right direction to go in terms of playing as close to my full potential as possible! My Mom coined the name for this device so we’ve been calling it “The Hammer” 🔨 Going to stream live here on Instagram within the next hour so come hang out! If you’re into vintage snare drums, Reverb has a great article by vintage drum expert Ned Ingberman. Ned covers his top 10 vintage snare drums, with some stunning photographs and in-depth explanations along the way. There are some jaw-dropping snare drums here, most of which are criminally expensive. In an interview with Revolver Magazine, Joey Jordison covers the “6 albums that made me”, citing the influences that inspired him musically and help craft his drumming style. On the list are some classic heavy albums including Slayer’s Reign in Blood, Alive! by Kiss, Led Zeppelin’s self-titled album, Kill ‘Em All by Metallica, Houdini by the Melvins, and Black Sabbath’s Master of Reality. 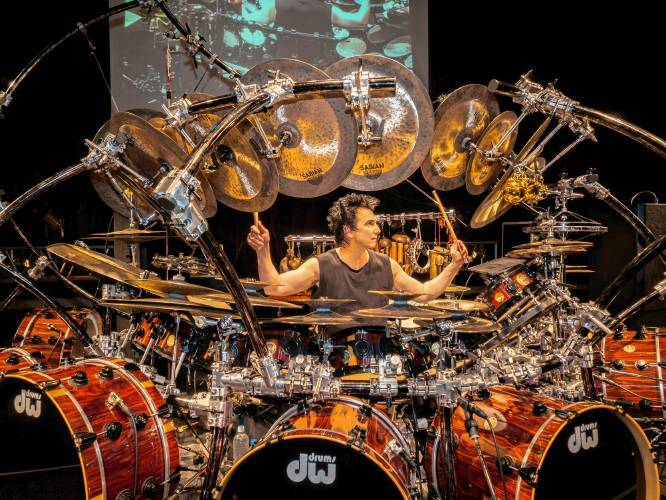 Drum legend Terry Bozzio is interviewed in the Daily Hampshire Gazette, where he covers his current and past projects, how he got into drumming, and some of his favourite performances and musical collaborations. Ringo Starr goes into detail on how he was introduced to drumming – while spending months in hospital as a sick teenager. Starr features on The Big Interview with Dan Rather (airing October 2nd). In a pre-release of the full interview, Starr talks of his problems with peritonitis and tuberculosis, which left him hospitalized for months. It was here that he discovered his passion for drumming, from a woman who would bring instruments into the hospital. Today (September 5th) marks the birthday of Paiste Cymbals founder Michail Toomas Paiste, born on this day in 1877. Finally, here’s a nice little fact: 60 years ago (on September 7th 1968) Led Zeppelin performed their first show at Gladsaxe Teen Clubs in Gladsaxe, Denmark, with John Bonham on drums. If you’ve got any other great news-worthy drum stories, feel free to let us know. Previous PostPrevious Drummers In California – Got Skills?